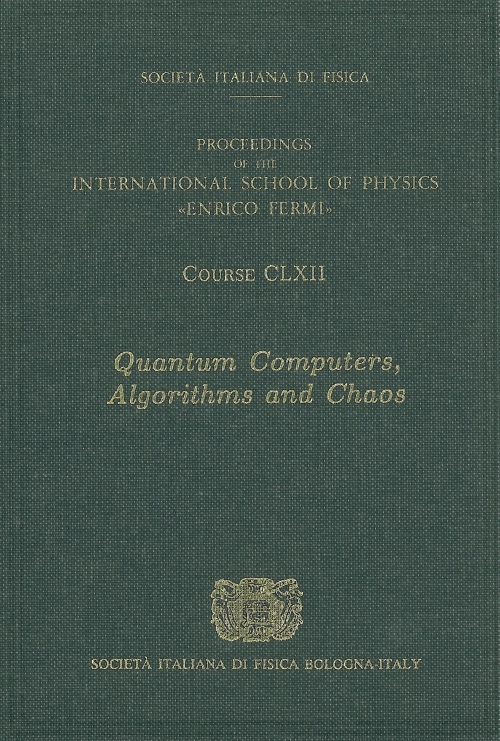 Casati, G., Shepelyansky, D.L., Zoller, P., Benenti, G.
162 of Proceedings of the International School of Physics "Enrico Fermi"
During the last ten years Quantum Information Processing and Communication (QIPC) has established itself as one of the new hot topic fields in physics, with the potential to revolutionize many areas of science and technology. QIPC replaces the laws of classical physics applied to computation and communication with the more fundamental laws of quantum mechanics. This becomes increasingly important due to technological progress going down to smaller and smaller scales where quantum effects start to be dominant. In addition to its fundamental nature, QIPC promises to advance computing power beyond the capabilities of any classical computer, to guarantee secure communication and establish direct links to emerging quantum technologies, such as, for example, quantum based sensors and clocks. One of the outstanding feature of QIPC is its interdisciplinary character: it brings together researchers from physics, mathematics and computer science. In particular, within physics we have seen the emergence of a new QIPC community, which ranges from theoretical to experimental physics, and crosses boundaries of traditionally separated disciplines such as atomic physics, quantum optics, statistical mechanics and solid state physics, all working on different and complementary aspects of QIPC. This publication covers the following topics: Introduction to quantum computing; Quantum logic, information and entanglement; Quantum algorithms; Error-correcting codes for quantum computations; Quantum measurements and control; Quantum communication; Quantum optics and cold atoms for quantum information; Quantum computing with solid state devices; Theory and experiments for superconducting qubits; Interactions in many-body systems: quantum chaos, disorder and random matrices; Decoherence effects for quantum computing; and Flature prospects of quantum information processing.